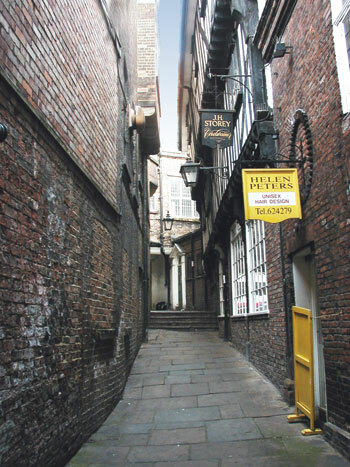 Lady Peckett’s Yard runs south-east from Pavement and is connected to Fossgate by a lane at right angles. The present name, from Alice Peckett, wife of John Peckett, Lord Mayor of York in 1701, who died in 1759, was used by 1782 and originally referred to the open space into which the lanes led. Their earlier names may have been Bacus gail (the north west to south east lane) and Trichour gail (that leading to Fossgate), first recorded in 1312 and 1301 respectively and meaning Bake-house and Cheat’s Lane. One of these may also have been called Osmond Lane in 1410. The house at the bottom of Lady Peckett’s Yard, No. 11, was built in the mid 16th century. It is of three storeys with attics and was originally timber-framed with jettied on the south and east sides. The east end of the house has been cut back and the present east end is of modern brick. The south side has been reconstructed in brick and the jetties underbuilt; on the first floor late 17th or 18th century and on the top floor early 19th century. The north elevation was refaced in brick in the late 17th century when a new wing to the north was added, probably by John Peckett. 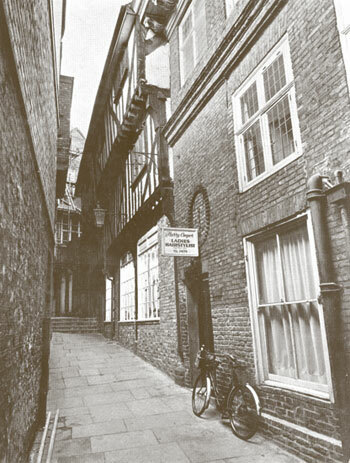 The north and west elevations facing Lady Peckett’s Yard have a bold brick string-course at the second floor and a heavy timber cornice with scrolled and foliated consoles at the eaves. In the west elevation to the later wing the upper floors have restored casement windows, each of two transomed lights, and every floor also has a blocked oval window with raised brick surround. The north elevation of the older block is pierced by an open passageway, formerly framed by timber pilasters and entablature, and each of the upper storeys has a window of three transomed lights, the upper part of each centre light being arched. The interior of the main part of the house has been stripped of partitions and fittings. Drawings of 1917 show 17th century panelling, fireplaces and elaborate overmantels, all now gone. Some of the original framing is exposed, including the dragon-beams necessitated by the jetties on two adjacent sides, to the south and east. The roof is divided into three bays by two trusses with short principals reaching only to the collar. In the north wing is a broad staircase with moulded close strings, square newels, bulbous turned balusters and heavy moulded handrails. The ground floor room is lined with early 18th century panelling in three heights and in the east wall is a semicircular display cupboard with scrolled brackets under the shelves. The fireplace surround has been removed, showing that a 17th century fireplace, 5 feet wide with chamfered brick jambs and arched head, was narrowed to just over 3 feet in the 18th century. On the second floor there is more early 18th century panelling and a fireplace surround of the same period. This property was acquired by the Trust in 1946. The first floor consists of a hairdresser’s salon and the upper floor, formerly offices, was converted into a flat in 1997.